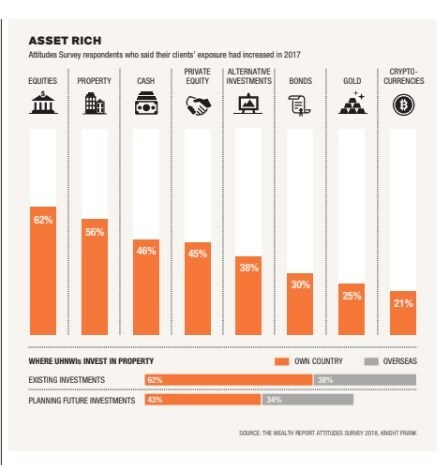 The appetite for property continues to thrive globally as equity markets may be making high net worth investors nervous. There was a staggering 56% increase in property investment in 2017, according to Knight Frank’s 2018 Wealth Report. The results of the Wealth Report Attitudes Survey highlights that in spite of stock markets reaching record highs in 2017, there is uncertainty around tax reform and politics. As a result, an increasingly professional pool of private capital is considering property as a safer investment option. The survey found that an increase in risk taking to yield higher returns was driving the property boom and predicts that the appetite for real estate would continue to increase as investors grapple with a low-return equity environment. 38% of the UHNWI’s also indicated that their portfolio already include overseas properties, the balance in their own country. According to the Wealth Report’s Prime International Residential Index (PIRI 100), a luxury residential market performance by global rank and geography, Cape Town grew by 19.9% between 2016-2017. This puts Cape Town in the number two position globally, after Guangzhou in China, which grew by 27% during that period. The average selling price of a home in these Cape Town suburbs has surged past the R15m mark!